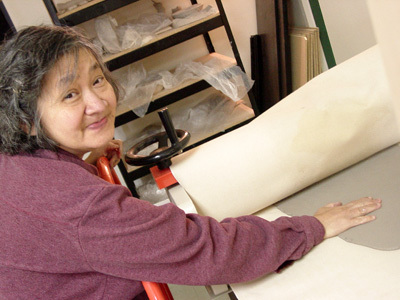 Joo Ee was born in 1954 in China, and now lives in Edmonton. Hokkien is her mother tongue, but she also knows some Mandarin and English. She comes to The Nina to hone her skills at clay work, her favourite art form, and drawing with watercolour crayons. Her clay designs show a clear vision, and often involve work on the potter’s wheel or abstract designs cut out from slabs. When using watercolour crayons, Joo Ee favours large blocks of bright colour. Experimenting in glass is always exciting. Outside of art, Joo Ee likes cooking and helping out at the group home where she resides. She has also volunteered at a day care. Being active is important to her; she follows an exercise program and regularly goes bowling and swimming. She has attended dance in the last couple of years. She also has a knack for jigsaw puzzles, and likes looking at books and magazines. A caring, giving artist, Joo Ee loves to show her work to others. She is comfortable in her own skin, and her confidence shows in her huge, warm smile.